Pay It Forward. I love that phrase! April 30 is Pay It Forward Day – a chance for you to spread kindness in your corner of the world. The phrase gained popularity in recent times when Catherine Ryan Hyde’s play by the same name was turned into a motion picture in which a young boy attempts to make the world a better place after his teacher gives him that chance. Check the Pay It Forward Organisation website for ideas on how we take this movement forward. Volunteer. Spread the word. 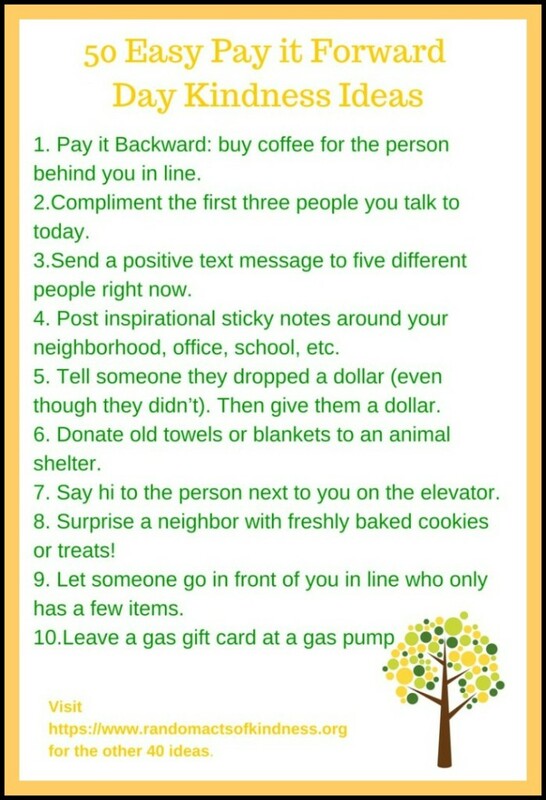 And here are 50 easy Pay It Foward Day Kindness Ideas for us to try on April 30 and thereafter. Let’s spread kindness – every day! I’m undertaking the NaBloPoMo for April – the theme is ‘grow’ and the Ultimate Blog Challenge. This is a brilliant concept, and worthy. Pay it forward, always! Every day is an opportunity to shine God’s love through Christ to this hurting world. May we be enabled and ready! I began yesterday –inadvertently–didn’t know there was a day! I let someone ahead of me in line. Love this idea of paying forward corinne ! thanks for this information and sharing your post.. YES! I’ll try to remember this date. LOVE IT. That was quick! I’m so behind on posting and reading your blog, Lata. Would love to hear what you do on that day! There are plenty of ideas on the Pay It Forward site – some involving books, which I think you might like.